I've been making a bunch of the zipper bags lately. I love Anita Goodesign's Zipper Bags 1,2,3 collection. These are done in-the-hoop (ITH) and come out great every time. My bags even won a recent contest on Facebook. The first time doing one of their lined in-the-hoop zipper bags can be so confusing. I've done enough of the large rectangle bags that I've now got a system down to get them without confusion. So, if you're considering making an Anita Goodesign large rectangle bag, take a look at this walk-through and hopefully it will help make your bag making-process easier. A. Back Panel 13" x 9"
B. Front Upper Panel: 12" x 3"
C. Front Lower Panel: 12" x 7"
So you will have 6 pieces of fabric and batting. I will refer to it by material number and panel piece. (Outside fabric pieces 1A, 1B, 1C; Lining fabric pieces 2A, 2B, 2C; and Batting pieces 3A, 3B, 3C). D. Wrist strap 13" x 2.5"
First step is to make the wrist strap and set it aside. 1. Fold the fabric strip (D) in half lengthwise, press with an iron to crease. 2. Unfold the strip and fold in the raw edges to meet at the center crease. Press again. 3. Fold the strip in half again lengthwise, on the original crease. Press. 4. Stitch a narrow 1/8" seam along each long side of the strip. 1. Choose your shape (ours is a large rectangle). 2. Choose your decorative design (ours is a monogram and logo). 3. Choose lined or unlined bag (ours is unlined). 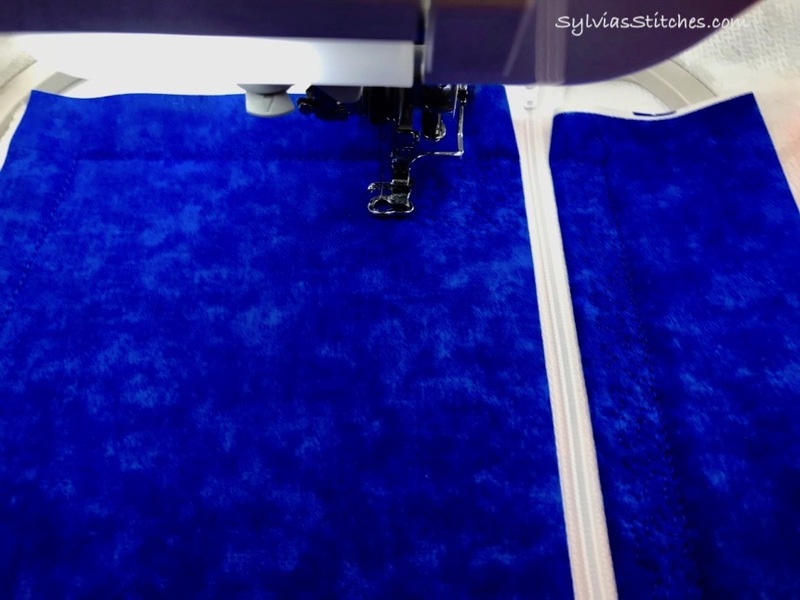 I will show the walk-through of this process done at the sewing machine, so no computer software is involved for this walk-through. Step 1: Stitch the back panel of the bag. Load the Large Rectangle Back design (file name Z123-LRx-BACK.PES) in your machine. 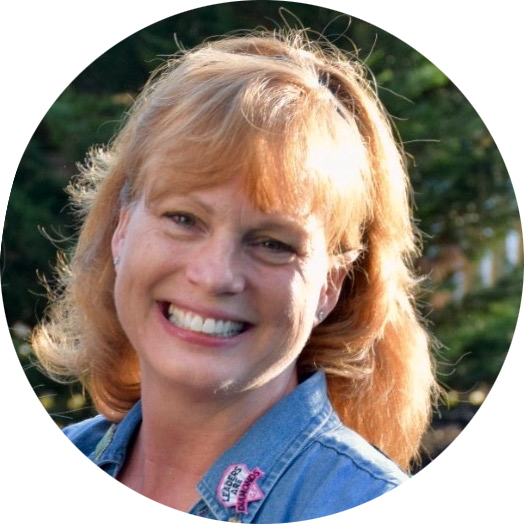 Your file name will may have a different character for the 'x', and file extension depending on the design you choose and the file format of your machine. Hoop a layer of no-show mesh in a large hoop. Run the first stitch for an outline border. Lay the Back Batting fabric (3A) on top of the outline, covering it completely. Run the second stitch which is the tack down stitch. Trim the batting outside the tack-down stitching. Lay the Outside Fabric Panel (1A) on top of the batting, covering it completely. Run the next step which is the tack-down for the fabric. Run the final step which is the quilting stitches. 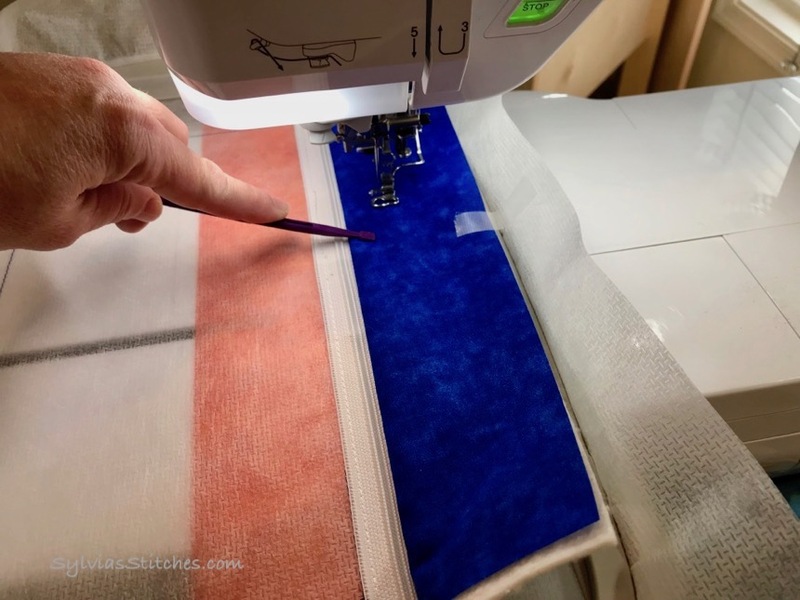 When complete, remove from hoop and trim the stabilizer even with the fabric panel. 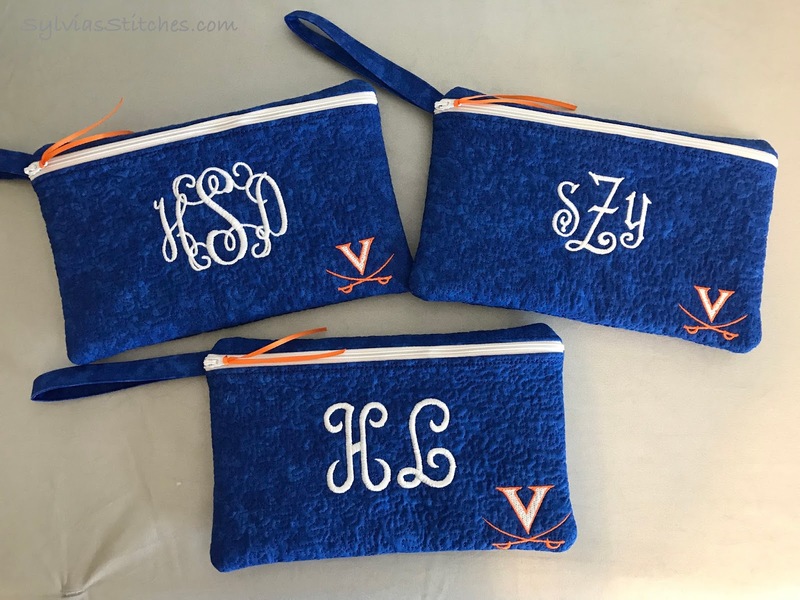 Step 2: Create your custom 1-2-3 Lined Zipper Bag design. Load the Large Rectangle Front design (file name Z123-LRx-.PES) in your machine. Your file name will may have a different character for the 'x', and file extension depending on the design you choose and the file format of your machine. In the steps below, I load the file from my usb drive, and will need to rotate it in order to have it fit the hoop. Add your chosen design. In my example, I am adding a monogram and logo. 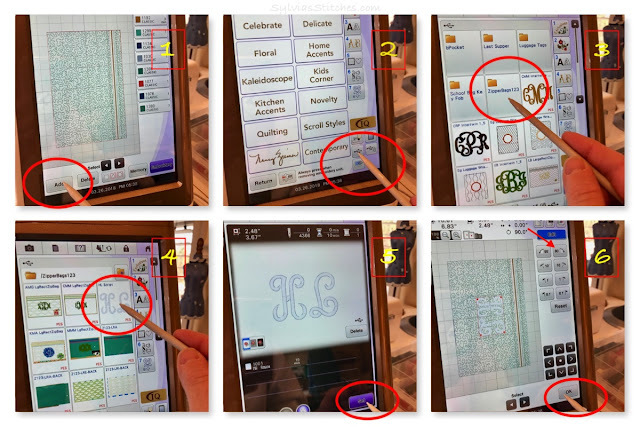 In steps 1-6 below, I choose a monogram and rotate it onto place. Steps 7-11, I chose another design (a logo) to rotate, change color and move into place. The final part of building your 1-2-3- design is to add the lining steps. Load the Large Rectangle Lined design (file name Z123-LRL-LINED.PES) in your machine and add it to your design. 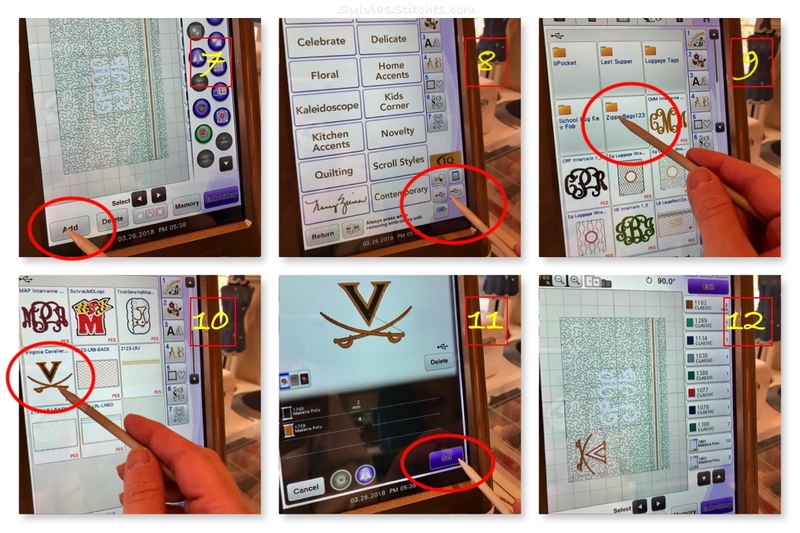 Your file will may have a different file extension depending on the file format of your embroidery machine. Now that you have the back panel stitched, and the design for the front created, time to put it together. Step 3: Stitch your 1-2-3 lined zipper bag! 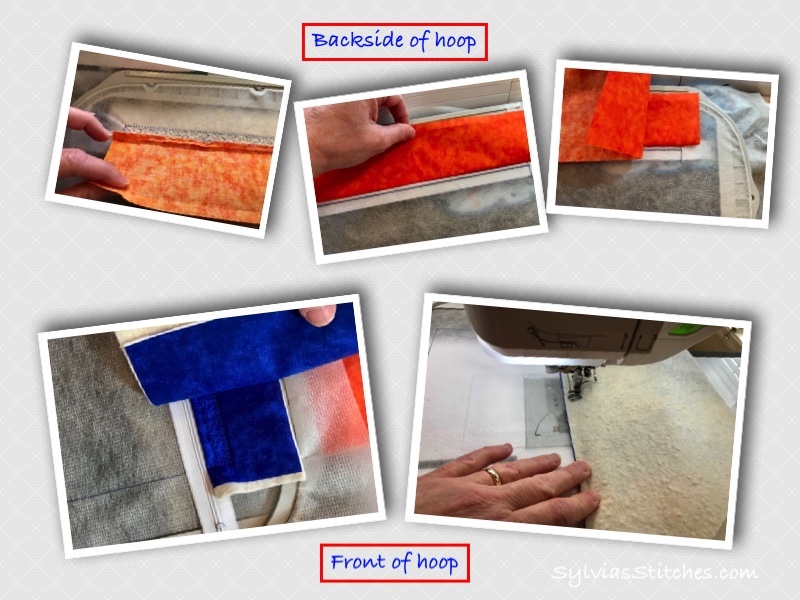 TIP: You will be working with both the top and bottom sides of the embroidery hoop. Just remember the Lining (2) fabrics are placed on the underside of the hoop, and the Outside fabric and Batting material (1 & 3) are worked on the top of the hoop. Hoop a layer of no-show mesh stabilizer in a large hoop. Run the first step which will stitch the placement stitches. Align the zipper (teeth face up) on top of the placement line. Ensure the zipper teeth match the zig zag line. 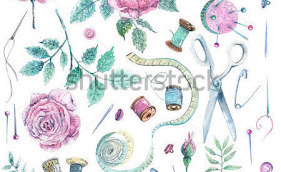 Use tape outside the stitch lines to hold the zipper in place. Run the second step to attach the zipper to the stabilizer. Lay the Upper Outside fabric (1B) face down on top of the zipper. Align a long side of the fabric with the top edge of the zipper. Lay the Upper Batting piece (3B) on top of this fabric. Tape in place outside of the stitching area. 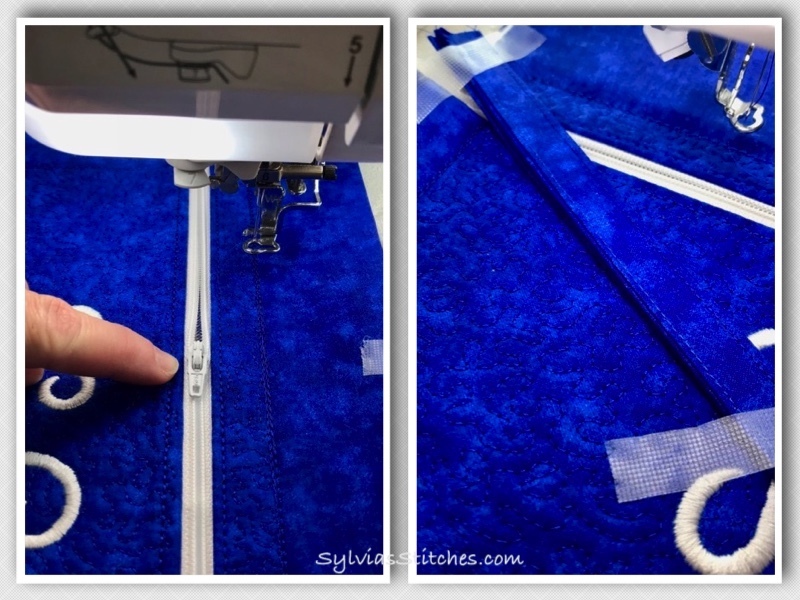 On the backside of the hoop, lay the Upper Lining fabric (2B) face down on top of the zipper. Align a long side of the fabric with the top edge of the zipper. Tape in place outside of the stitching area. Run the third step which will attached these fabrics to the zipper. Fold up the Upper Outside fabric & batting (1B & 3B) along the stitch line. Tape it in place outside of the stitching area. 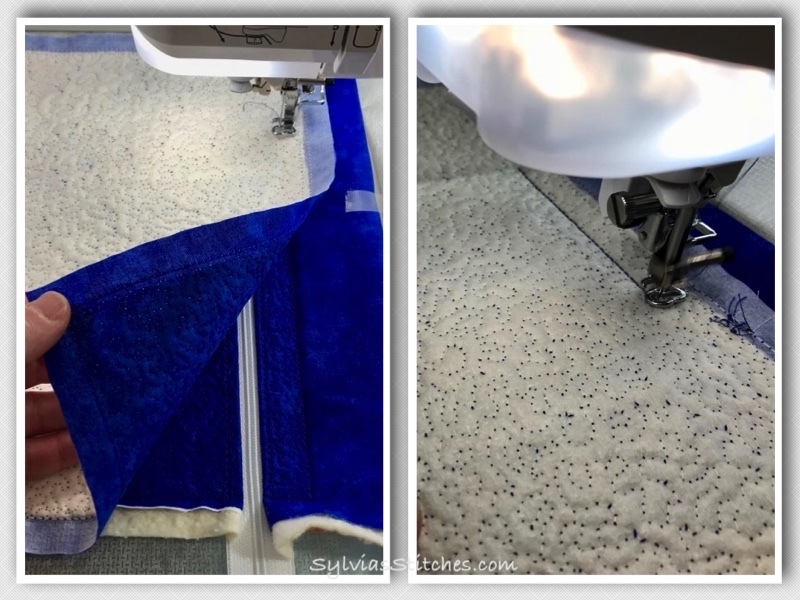 Do not do anything with the lining fabrics on the underside of the hoop. Run the fourth step which will tack the upper pieces in place. 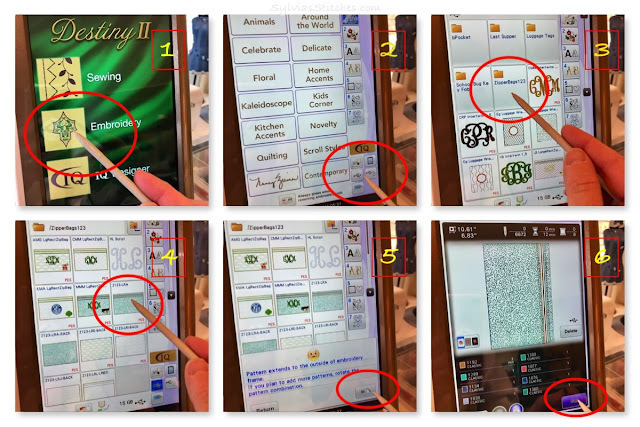 Run the fifth step which are the quilting stitches for the upper panel. On the backside of the hoop, fold up the Upper Lining fabric (2B). Tape it in place outside of the stitching area. 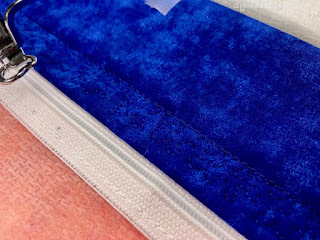 Also on the backside of the hoop, lay the Lower Lining fabric (2C) on top of the zipper, aligning a long edge with the bottom edge of the zipper. Tape it in place. 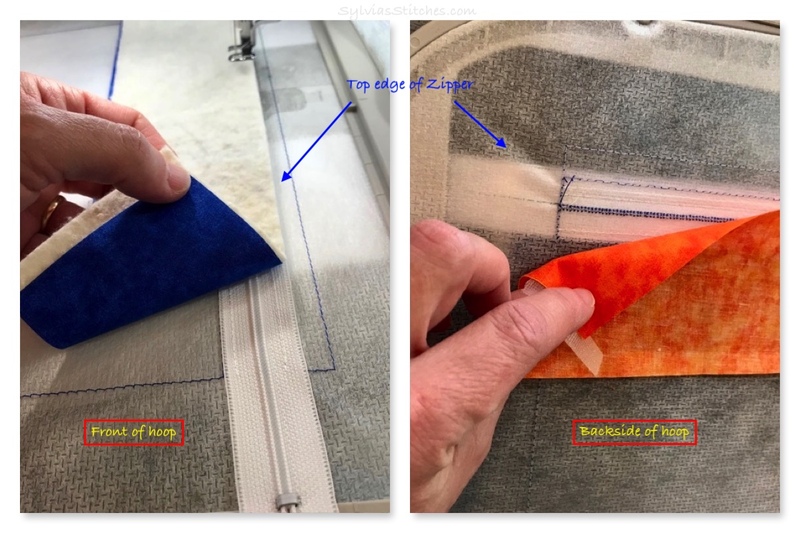 Flip the hoop back to the right side, and lay the Lower Outside fabric (1C) and Lower Batting (3C) on top of the zipper, aligning a long edge with the bottom edge of the zipper. Tape it in place outside the stitching area. Run the sixth step which attached these pieces to the zipper. Fold down the Lower Outside fabric and batting (1C & 3C). Tape in place outside the stitching area. 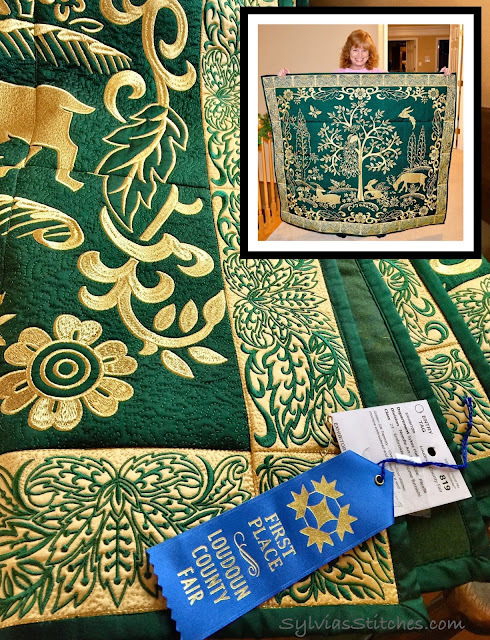 Do not do anything with the lining fabrics on the underside of the hoop. Run step seven which will tack the lower fabrics. Run step eight which will stitch the quilting stitches on the lower panel. 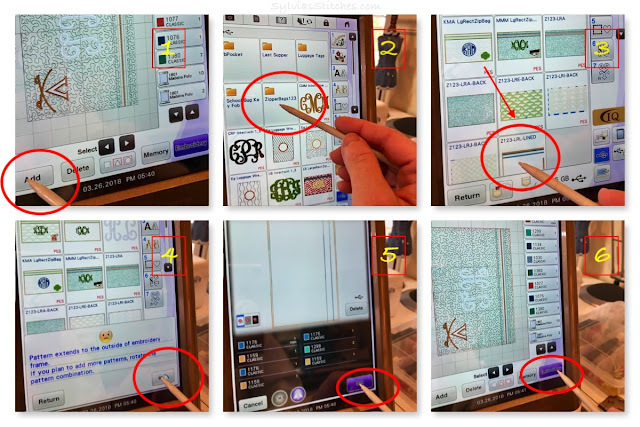 Run the next step(s) which will stitch your chosen design(s). My example stitched a monogram and logo. After the embroidery is complete, on the backside of the hoop, fold down the Lower Lining (2C) fabric and tape in place. Run the next 5 steps without making any changes in between each step. Tack-down stitches will be sewn in the four corners of the design to hold all fabrics in place. Tack down stitches for the top panel. Tack down stitches for the bottom panel. Bean stitching along the bottom of the zipper. Open the zipper to the center. If you are adding a wrist strap, place it on top of the panel now. I angle mine from the top corner. Fold the strap in half, place the raw edges an inch or so outside the stitching lines, and tape the strap in place on top of the panel. Place the back panel of the bag face down on top of the front panels of the bag. The back panel is larger than the front, and that is OK. Tape in place. Run the second to last step which will attach the back panel to the front panel. On the backside of the hoop, lay the Lining Back Panel fabric (2A) face down on top of the lining fabrics. 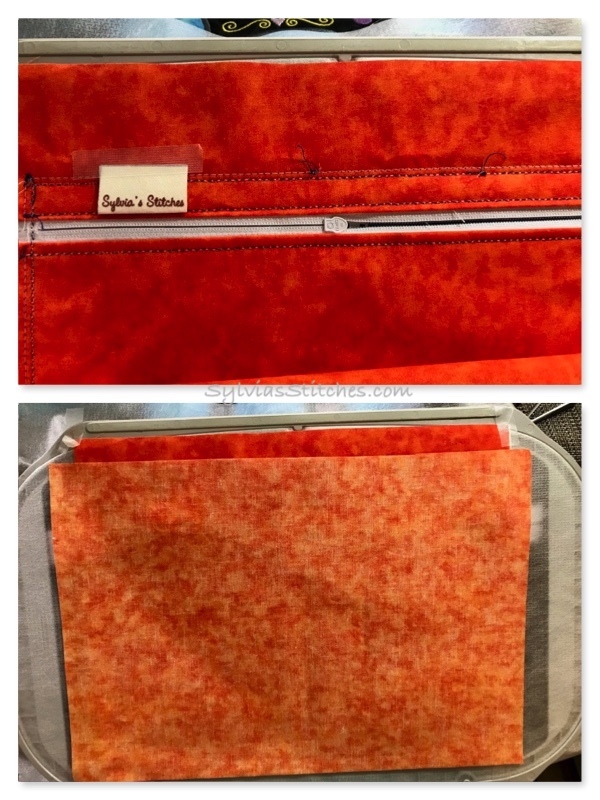 If you have a label for your item, tape it in place along a seam. I place my label along a top seam towards the end of the zipper. Tape the Lining Back Panel fabric to the design. 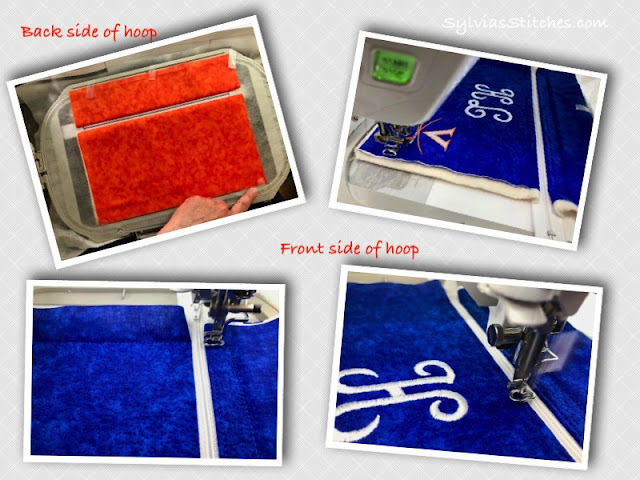 Carefully place the hoop back in the machine and run the last embroidery step which will attached the lining. A gap will be left open so the item can be turned out. Congrats! Your bag is stitched! Remove from the hoop and remove the tapes. 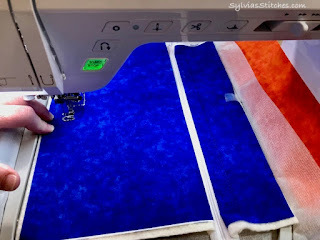 Trim the edges to 1/4" seams. I leave a little bit wider seam at the opening gap to help with the hand-stitching. Clip the corners and turn the bag inside out through the opening. Push out the corners. 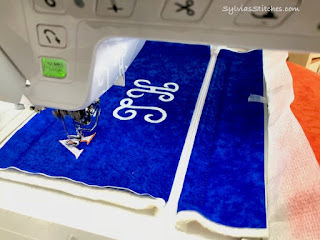 Use a needle & thread to hand sew the opening close. Use a seam ripper and carefully cut away the excess stabilizer from behind the zipper. Turn the bag right side out through the zipper opening.